Product contains milk, wheat, soy, tree nuts (almonds, cashews, pecans), peanuts, egg. Produced in a facility that process other tree nuts. A perfect spring picnic has never been easier! We filled a stylish, reusable picnic basket with a generous assortment of our favorite spring snack essentials, plus a serving set to make enjoying effortless. Three savory kinds of summer sausage, four creamy cheeses, gourmet mustards and condiments, plus crackers, crisps, and mixed nuts create a perfect charcuterie spread. Treats like our Mini Meltaway Mints, Dark Chocolate Peanut Butter Meltaways, and Dark Chocolate Sea Salt Caramels add the right amount of sweetness to this gift. 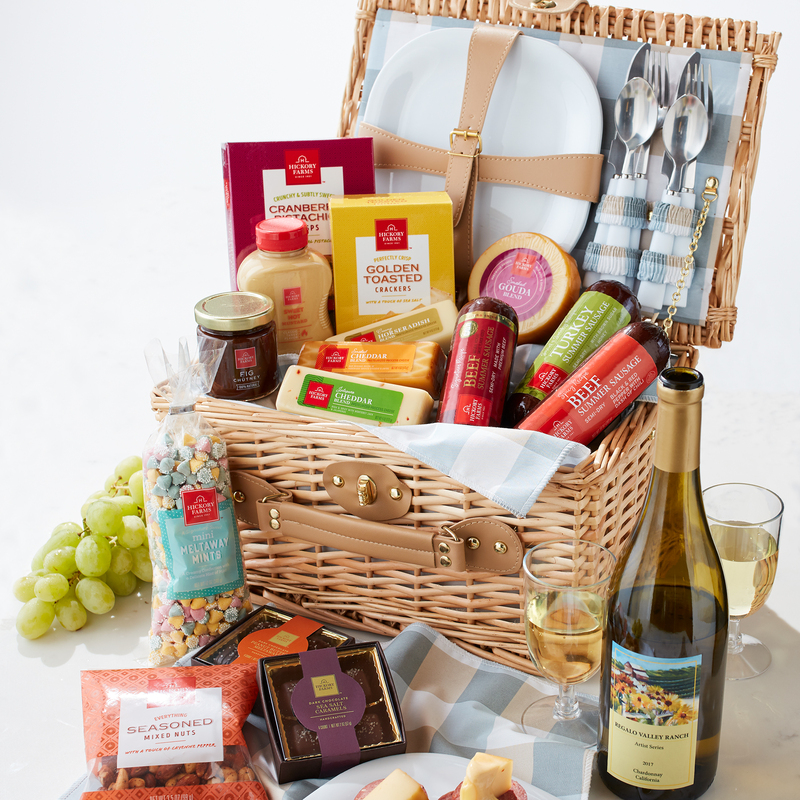 A glass of Regalo Valley Ranch Chardonnay is a delicious complement to this picnic. Order by 1pm EST for next day delivery. Wine gifts must be purchased, received, and signed for by an adult 21 years and older. Hickory Farms is a marketing agent for wine products. Wine gifts cannot be shipped to PO Boxes, outside the US, or to these states: AL, AR, KY, MS, RI, UT, AP, GU, PR, VI, AK, HI.